The nationally funded group uses a new social media tactic to build an audience with clickbait content. A longtime national super PAC backing Democratic candidates has dropped almost a half-million dollars into Maine to help elect Janet Mills governor, using the funds to fuel social media campaigns that include a Facebook page that doesn’t even mention politics – just clickbait-type articles about Maine. 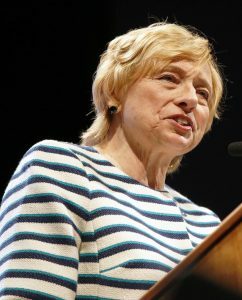 Janet Mills, the Democratic candidate for governor, got a boost in financial support from a super PAC. Priorities USA Action PAC reported receiving $490,346.51 and spent all of it, mostly on social media ad buys, according to an initial financial report filed Friday with Maine’s ethics commission. The money came from the national super PAC of the same name, which is a longtime Democratic powerhouse PAC that received $6 million in contributions from Donald Sussman and $5 million from George Soros this year alone, according to the Federal Election Commission. Other major independent expenditures reported Friday include an almost $360,000 ad buy for Republican gubernatorial candidate Shawn Moody by the Maine Republican Party, and a more than $290,000 ad buy for Mills by Citizens who Support Maine’s Public Schools PAC. A Better Maine political action committee, backed by the Democratic Governors Association, made major traditional media buys – spending $302,000 on adds supporting Mills and $371,000 for ads opposing Moody in recent weeks. The “Maine Matters” page created by Priorities USA Action appears rudimentary at this stage, with a lone classic lighthouse image and a single post linking to a Portland Press Herald article about a company printing 3D shoes. The strategy behind the pages, outlined in a recent Daily Beast newsletter, is being used in campaigns in several states. The goal is to use the feel-good posts to build an audience – then run political advertising on those pages that appears alongside the newsfeed, but not in the feed itself. Readers who “like” a post or page likely don’t even realize the entire experience is paid for by a major super PAC. Daily Beast newsletter Pay Dirt said the Priorities USA Action super PAC has set up similar state-specific pages in Florida and Indiana, along with some national pages being served with ads designed to sway key midterm Senate contests. Between January 2017 and August 2018, the national PAC has raised $18.2 million and spent $12 million, according to FEC filings. In Maine, Priorities USA Action spent all of its funds on either ad production or media buys on high-profile social media sites, including $198,847 on Facebook, $36,109 on YouTube, $22,029 on Google, $12,179 on Spotify and $8,134 on Pandora, according to state campaign finance reports. – $193,291 by the Maine Democratic State Committee. The biggest expenditures, between $15,000 and $20,000 each, were to support Democrats in four Senate races: incumbents Shenna Bellows in Senate District 14 and Troy Jackson in Senate District 1; Thomas Wright of Berwick, who is facing Republican Robert Foley in the open seat in Senate District 34; and former Rep. Karen Kusiak of Fairfield, who is challenging incumbent Scott Cyrway in Senate District 16. • $121,476 by Rebuild Maine, to support Democratic Party candidates, including $15,525 for Ned Claxton of Auburn, who is challenging Republican Eleanor Espling of New Gloucester for the open seat in Senate District 20; $14,512 for incumbents Nate Libby in Senate District 21 and $12,375 for incumbent Eloise Vitelli in Senate District 23. Rebuild Maine has taken in total contributions and loans of $1.38 million and spent $854,000 – leaving it with $531,330 cash on hand. • $50,000 by the National Association of Realtors Fund, for ad buys of about $9,000 each for Republican state Senate candidates Amy Volk of Scarborough; Jayne Giles of Belfast; Eleanor Espling of New Gloucester; Matthew Pouliot of Augusta and David Woodsome of North Waterboro. The PAC has taken in and spent a total of $95,766. • $500 by the Senate Democratic Campaign Committee to oppose Volk. The PAC has taken in $6.7 million in contributions and loans, and has spent $6.3 million, leaving it with about $260,000 on hand.